This post was last modified: Mar 31, 2019 at 5:08 PM by The Dealer. The numbers dwindle and your time runs low, do you have what you need to make it even further? Or perhaps someone wants it more than you. I've noticed a distinct lack of some of you guests enjoying the festivities planned out tonight. I must say after all the work I go through to keep this deck running it brings me great sadness to see some people not wearing their masks. He chuckles as if to belittle his own statement. So how about this. If you don't attempt or be seen with your MASK on, I'll be delivering a hefty role debuff to you. And this time, your partners are not excluded lest they won't know when to put on their mask. It's not a party until everyone has played. Hopefully you've been keeping track of the masks and will be careful not to waste your own... For the future of course. Master Bedroom: The main staying quarters for the host of the party. He'll always start his night here but he may not leave every night. Expect to find some personal possessions as well as decorations and standard necessities for living. It also has it's own bathroom! Hallways: Standard expanses of room that have paintings and other artistic decorations. It seems to be going for a vintage style with it's wall paper and colors. Museum: A broad room speckled with plaques of information and exhibits regarding various topics and items. If modern interests are what you enjoy, it'd take some serious commitment to get through the entire exhibits, but at a glance they seem to focus on the house's history and the modern world in a gothic-punk style. There's a small window that can seen into the Main Foyer. Den: A cozy room to relax in for when the party gets too wild downstairs. Enjoy countless sofas and seats around a broad fireplace to warm the room. Some bookcases and knickknacks provide the room with sparse decoration, but the bear rug and lighting adds to the relaxation of the room. 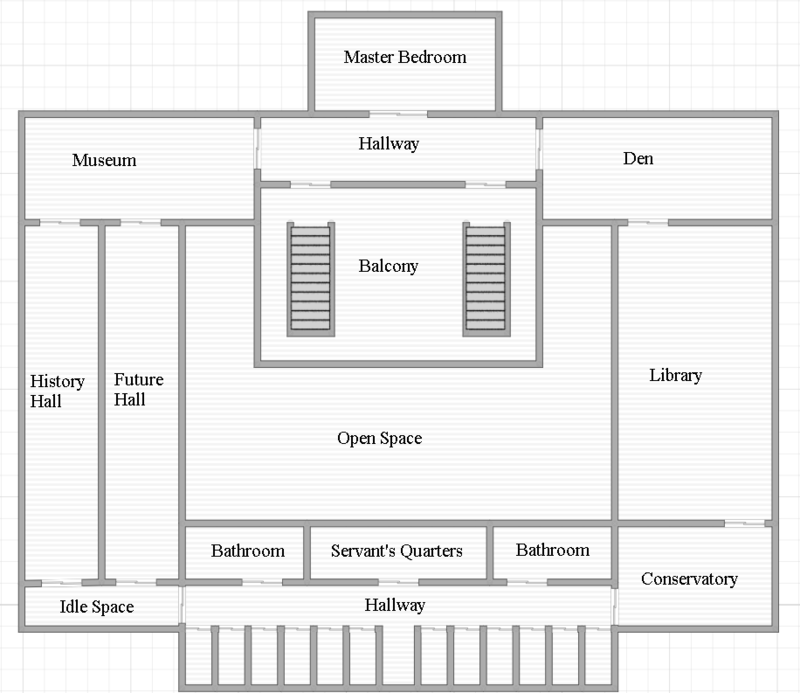 A window looks down into the Main Foyer in the southwest corner and A dumbwaiter lies open in the northeast corner accompanied by a Bell above it, and a string tied next to the opening. Balcony: A high rise above the Main Foyer this area provides nothing but a bird's eye view of the room below and the window's around. Some secure railing should keep any relaxing guests safe from slipping. It does not see those around the stairs or near the Game Room's door. History Hall: A long hall featuring spotlighted moments of history in the momentous life time of the world. It's not wide but the walls are not scarce of information. There's a few cases of antiques from different eras, from neanderthal clubs to Japanese Katanas. Future Hall: Ever wonder what the future looks like? Someone took a good guess at what they think the future would look like, from flying cars to personal customization after birth. There's some cases with props in them on this side too, but they can't be real, right? Open Space: Naught but a chandelier with heavy looking chains hooked to the mouths of various Wulves. It'd take a beast of an effort to knock this thing down. Library: Books galore, need I say more? There's plenty of neatly stacked books on the shelves with ladders to reach those at the top and some tossed onto the floor into piles and heaps. The alignment of bookcases in here makes it impossible to see from one side of the room to another, but climbing on top of a shelf gives a better view. Idle Space: Just a bland room really, doesn't seem to be anything in here? Left Bathroom: An ornate red colored bathroom with "M" marked on the door. Expect everything you'd find in a normal bathroom, but fancier. 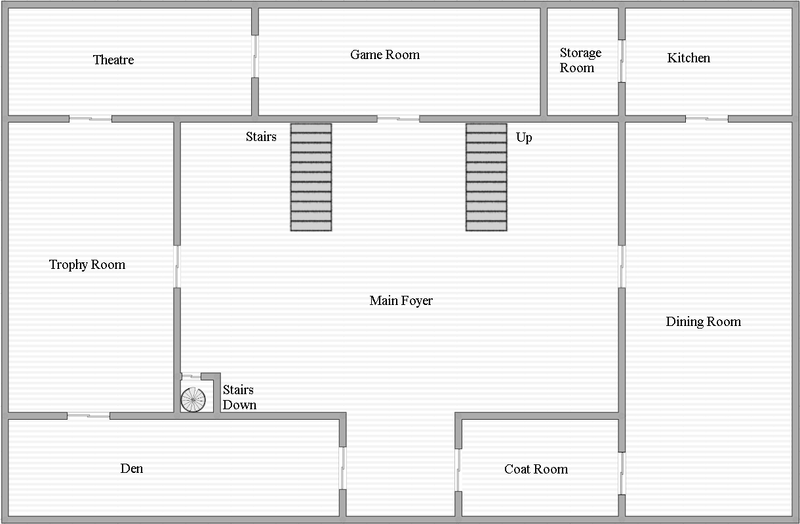 Servant's Quarters: A larger but modest room for servant's to take breaks and sleep out the night in. It's as bland as you might expect, but it's also roomier than it looks. There's 3 bells in here that are tied into the wall off to somewhere else, and a speaker that seems to come from somewhere. There is a decent sized window that can see down into the Main Foyer. Right Bathroom: An overly ornate purple colored bathroom with "W" marked on the door. It's got roughly the same things as the other bathroom, but it's much more gaudy in here. Conservatory: Various plants and foliage grow up towards the skylight in here. There's also a small section caged off dedicated to raising birds of various breeds, both luxury and performance types. A small desk in the corner contains some paperwork and notes as well as a book that has pictures and details for identifying various plants. Theatre: A small practice stage, complete with props, lighting, and the occasional costume fill the far corner of this room, with the rest dedicated to more lazy entertainment such as watching the stage or enjoying the radio. Game Room: If the Main Foyer is the heart of the party then the game room is it's stomach. Refreshments such as alcohol and carbonated beverages are set around the room for guests to enjoy, but most are focused around right side of the room where a small bar is attended by...nobody. The center of the room features dimly lit pool tables, smoke areas, some dart boards, and other various endeavours to pass the time. Storage Room: Set to a stable low temperature, many foodstuffs are left in here so long as they have a long shelf life. Don't expect to find anything perishable in here. Kitchen: Perhaps the least fancy room in the house, mostly servants come in here but occasionally a guest will come and visit. Standard utensils can be found in here and an icebox sits locked to keep it's precious perishables safe. A dumbwaiter lies open in the northeast corner accompanied by a Bell above it, and a string tied next to the opening. Trophy Room: Animal heads, Picturesque vacations, everything you'd put in one room to show your guests and brag about how great you are. Some retired outfits from safari expeditions and other wilderness outings stand protected by the elements in glass cases, often with an accompanying tool next to them, such as a blunderbuss or grappling hook. There's an Artic camouflage uniform that seems fit for combat if not for the dark red stain on it's neck. Main Foyer: A Vast room filled with bright light and fancy rugs to give guests the time of their life. A stage sits in the southeast corner for bands and performers to entertain guests, complete with sound and lighting equipment, but the controls seem busted right now. Some stairs down sit behind a door in the corner on the other side. Near the front entrance are some gorgeous flower arrangements and imposing looking suits of armor standing empty handed. Dining Room: An opulent room second only to the Main Foyer. Filling most of the room is an incredible hardwood table with candles, fine china, and glittering silverware all set out for guests. The only thing missing in this room is a feast, but a lone dish in the middle lies covered with a silver dome. Den: Similar to the den upstairs, guests will find a similarly room emphasized on comfort and chatting with guests. This room seems to have less furniture however and appears to have a higher decoration standard. One could assume this was meant for the more temporary guests as opposed to the aprty guests who would head upstairs. Coat Room: A side room for guests to drop off their outdoor clothing and switch into something more comfortable. There still remains some discarded coats, hats, and other clothing, but nothing fancy. Master Bathroom: To accommodate for only one bathroom down here the Master Bathroom was set down here. Comes complete with everything a bathroom should have from showers, baths, to even a sauna in the corner. Like seriously, this bathroom is the ultimate bathroom. Just try and break it. Hallway: It's the same as the other hallways except it's just slightly more decorated with dust. Stock Room: If it isn't something you'd find in the kitchen or in storage, you'd find it here. Barrels, crates, and bags of who knows what lies around discarded instruments here. A dumbwaiter lies shut against the east wall. There is no bell, but there appears to be a place where there was one. Showroom: A more secluded museum meant for storing antiques and curios. Some of it looks like garbage and some of it looks like poppycock. Anything from fake looking stone tablets with scribbles on them to balls of lord knows what lie in foggy glass cases. The room seems to have a sense of grandeur that it has lost over time of being unused. ??? 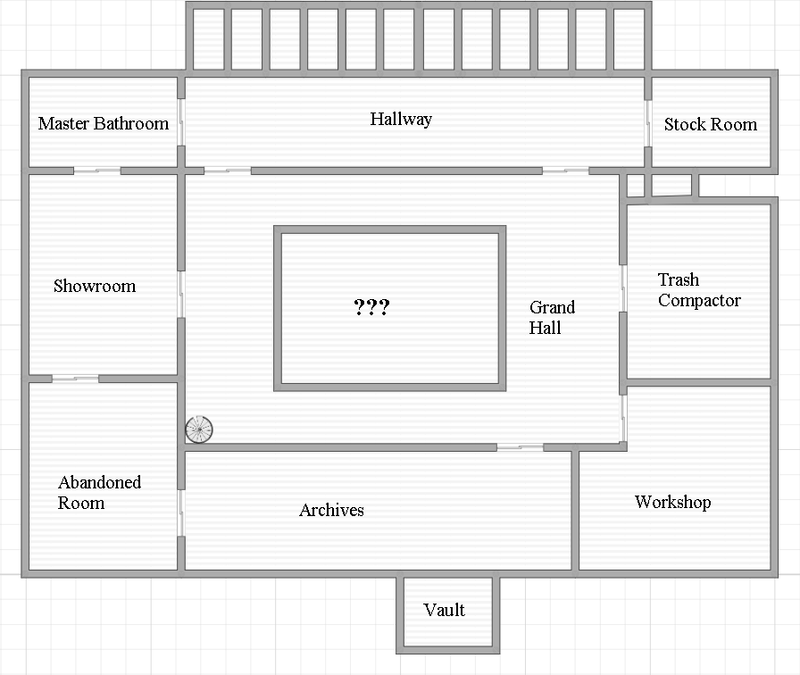 : Stuck in the middle of the Grand Hall is 4 walls. They tried to cover whatever it is with wallpaper and paint, but it's peeling away and revealing scratches, markings, and weird pictures. Grand Hall: Other than the eyesore in the middle this square of halls has decorations fit for any creepy basement. Pictures that seem to follow you with their eyes, too many clocks, and was that suit of armor there before? Trash Compactor: An empty room if you ignore the piles of trash crunched up into cubes. A large machine stands in the room that eats garbage fed into it and compacts it when given the command. The key is currently missing. There's also some scratch marks on the north end of this room. Abandoned Room: Devoid of any lighting it's kind of hard to see what's in here. In fact, you can't. Archives: Not so much archives as "all of this documentation had to go somewhere". There's desks. rolls, and file cabinets full of papers, but there's no organization to them, so you'll be guessing at anything you take. The entrance to the vault is in this room, but it's locked up tight. There appears to be no obvious way to open it. Workshop: Far away from the noise of the party is a humble workshop outfitted with tools and materials for standard craft working. Anything from wood working to welding you can find in here, but supplies are limited. On one of the racks it appears that something long and pole shaped is already missing. Vault: Who knows what valuables could lie inside. A secret weapon? Wealth beyond your dreams? Or is it already looted and just empty to put on a facade. You have until 10:00am AZT (PST) on the 2nd for your submissions. "Adell", @Coffee, @Bruno Bucciarati, @Francis Shoemaker, @Halo 2, "Two_Finger", "Misery the Inconvenient", @Grimm, "Mii", "Pohatu", @King Radical, @James. @Sebastian Michaelis, @Isabelle, @Tsumugi Shirogane, @Ryutaros, @MarioPants, @Junko, @Bill Cipher, "Rozalin", "Fortnite", @Slayer, @Reigen Arataka, and the final room "Cool Cat"
HOWDY, KIDS, I GOT A VERY SPECIAL EVENT COOKING FOR TONIGHT! IF YOU LIKE MEDDLING WITH THINGS THAT ARE BEYOND YOUR CONTROL, THEN COME ON DOWN TO THE MAIN FOYER, WHERE I’LL BE HOSTING A FAMILY BARBEQUE/DEMON SUMMONING RITUAL! ALL THAT’S REQUIRED IS THAT YOU HAVE YOUR MASK ON! YOU DON’T WANT THOSE DEVILS KNOWING YOUR TRUE IDENTITY, DO YOU? YOU SHOULD ALSO BRING SOME RAW CHICKEN TO STAB DURING THE RITUAL! THOSE DEMONS LOVE THEIR CHICKEN BLOOD AS MUCH AS IRISHMEN LOVE POTATOES! FINALLY I’LL BE PLAYING MY INSTRUMENT DURING THE PROCESS, SO IF YOU HAVE ANY DEALS YOU WANT TO STRIKE, YOU KNOW THE GUY! I’LL SEE YOU AT THE BABY SHOWER OF THE APOCALYPSE! HEY, I’LL BE DAMNED! THE RITUAL ACTUALLY WORKED! WHOOPS, GOT A LAST MINUTE CALL FROM THE DEMON! HE SUDDENLY SWITCHED TO VEGANISM AND INSTEAD DEMANDS A SACRIFICE IN THE FORM OF A GLASS OF KOOL-AID! THIS MIGHT BE ASKING FOR TOO MUCH, BUT IF YOU'RE STOPPING BY THE RITUAL, JUST MAKE AN ADDENDUM TO YOUR SUBMISSIONS TO REPLACE "CHICKEN BLOOD" WITH "A GLASS OF KOOL AID"! THIS IS IMPORTANT I SWEAR!